Dr. Alberto Falquez was born and raised in Barranquilla, Colombia. 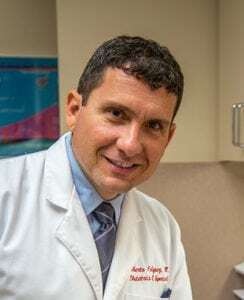 He received his medical degree from the Universidad del Norte Faculty of Medicine, having completed several clerkships as a visiting medical student at Jackson Memorial Hospital. He moved to Miami, Florida where he worked in research at the Department of Obstetrics & Gynecology, University of Miami School of Medicine. Dr. Falquez then moved to Galveston, Texas, where he completed his residency in obstetrics & gynecology at the prestigious University of Texas Medical Branch in June of 2011. Returning to Miami, he worked for several years as an attending physician at Mount Sinai Medical Center and joined Doral Beach OB/GYN in 2014. Dr. Falquez is a diplomate of the American Board of Obstetrics & Gynecology and is fluent in Spanish, English and French.